Here is the sleeve slipped into the first shift. As a follow-up to the previous post – and a helpful comment, thank you! – I’ve tried slipping the sleeve (cuff, undersleeve, engageante?) into the sleeve of a linen shift. Well, three different shifts. Above is the first. Very nice fit! The next one, below, is an even better fit. Just about perfect! You’ll notice the sleeve length on this shift, unlike the first one above, extends past the gusset. The last one I tried just for comparison. It’s obviously a wider sleeve, and I have a feeling that the shift was perhaps of an earlier date, and the sleeve was cut off to fit later fashions. And after looking at a few over the years, I wouldn’t be surprised if that was rather common. 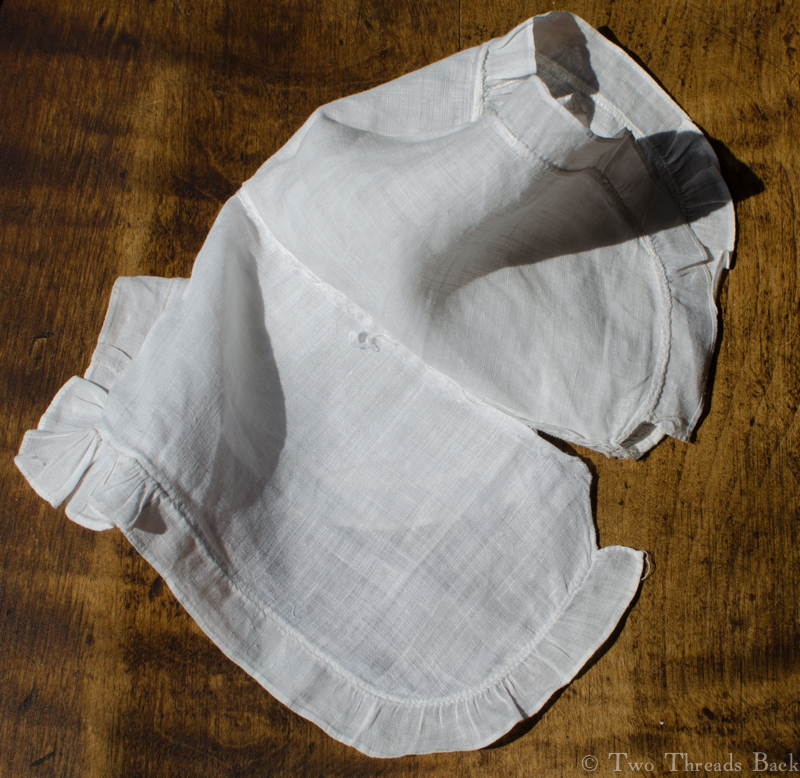 Although a shift didn’t require as much work as man’s shirt, the tiny stitches worked on fine linen were very tedious to do, and clothing was valuable! Sorry Cinderella, it’s not quite right. This last shift is in the original “attic find” condition. Can you tell? The Mystery. Cuffs? Undersleeves? What the heck are they and what did she wear them with? It’s summertime, as you can tell by the artfully posed hydrangea, and time for a little mystery. 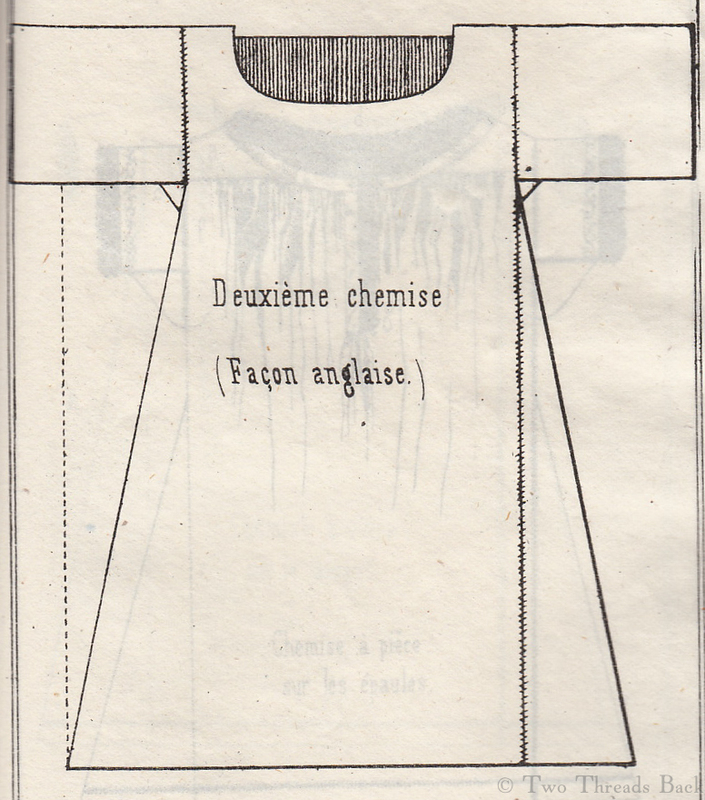 Every now and then I come across examples of plain sewing that are rather puzzling. This pretty pair of sleeves (or cuffs) are not like any I’ve seen before. 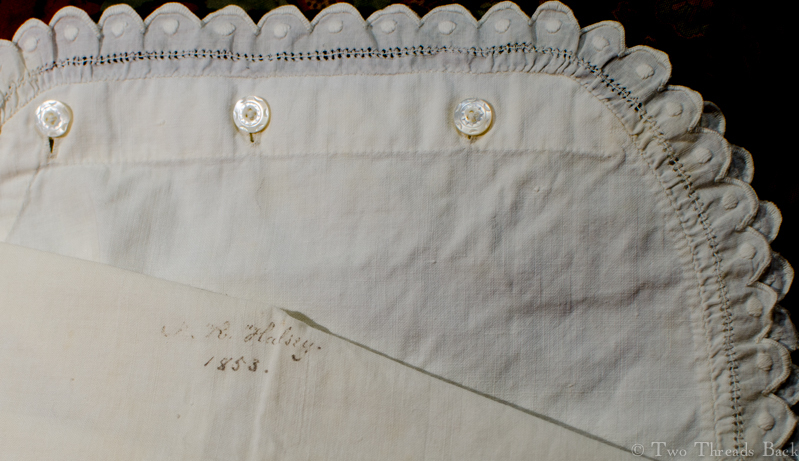 On the muslin end of the sleeve there’s a triple row of gathered cording, a feature that was popular in the early 1800s. 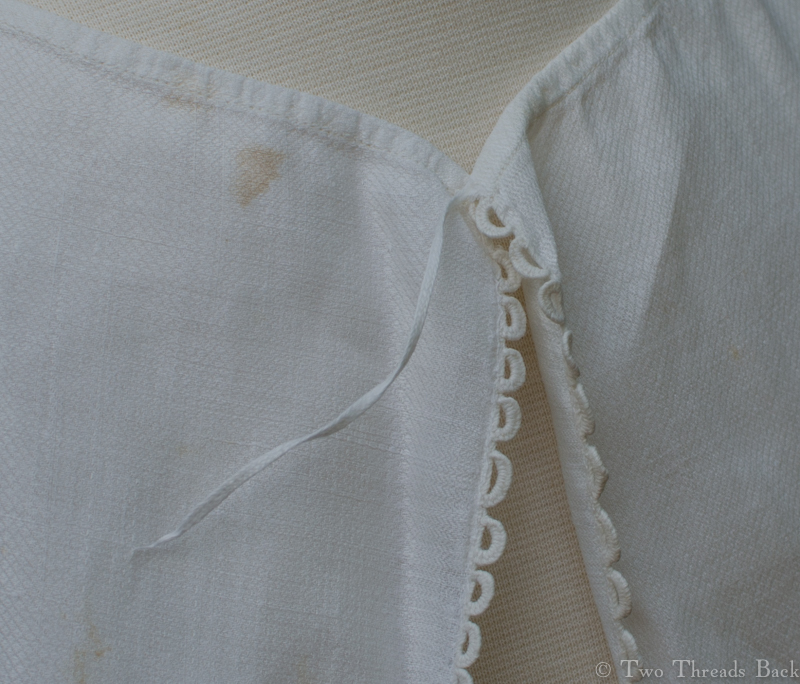 The linen end has a narrow hem and is divided all the way to the gathers, almost like it was meant to fold back. 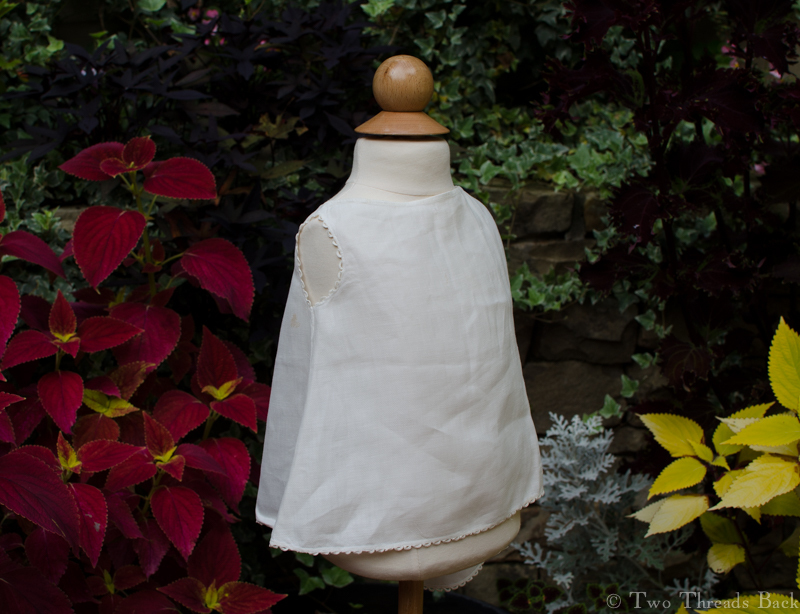 The sewing is neat and tiny, with an occasional clumsy stitch, just along the gathers. And speaking of the gathers… the method used to attach them is not commonly used for joining a flat to a gathered part in most of the plain sewing I’ve seen – a type of felling? 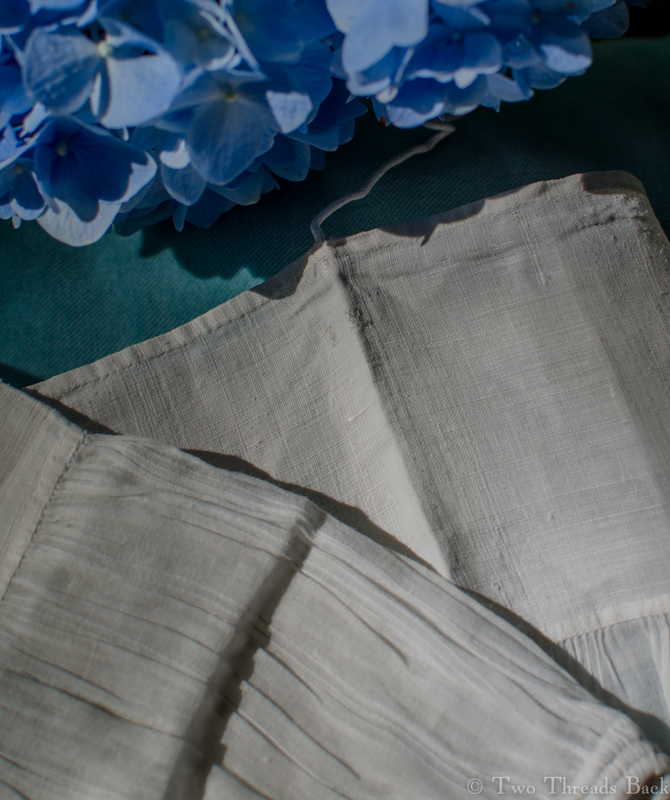 It appears the linen and muslin were half-backstitched together, then felled, with a stitch in each gather. Well, silly me. Of course the usual method of inserting gathers into a band and then sewing them on both the inside and outside wouldn’t work here: there’s only one layer to the band! 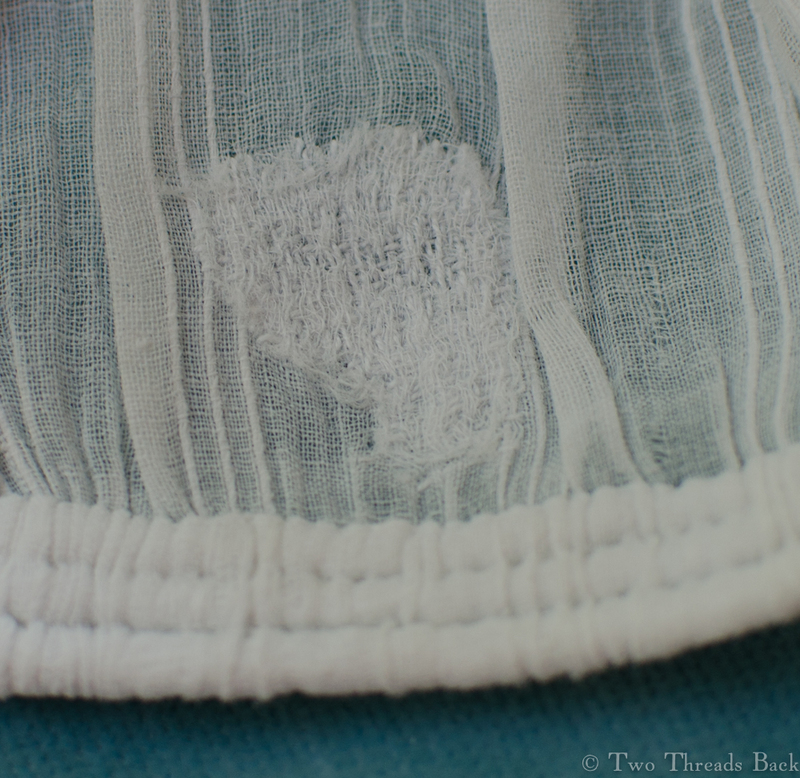 The blue cotton marking thread is almost invisible now, but it is miniscule. 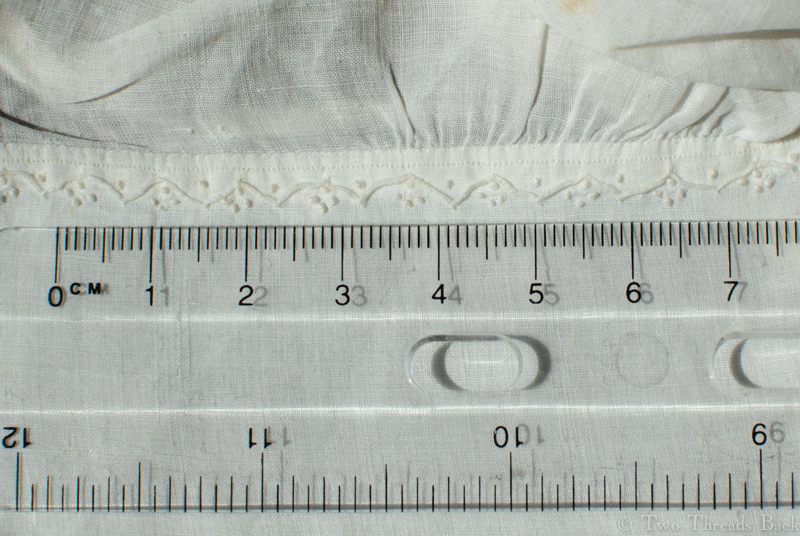 The height of the letters is .4 centimeter (just over 1/8 inch), and each stitch is made over two threads. Early marking charts and samplers did not have a “J” but used the letter “I” instead. So was the owner “J R” or “I R”? 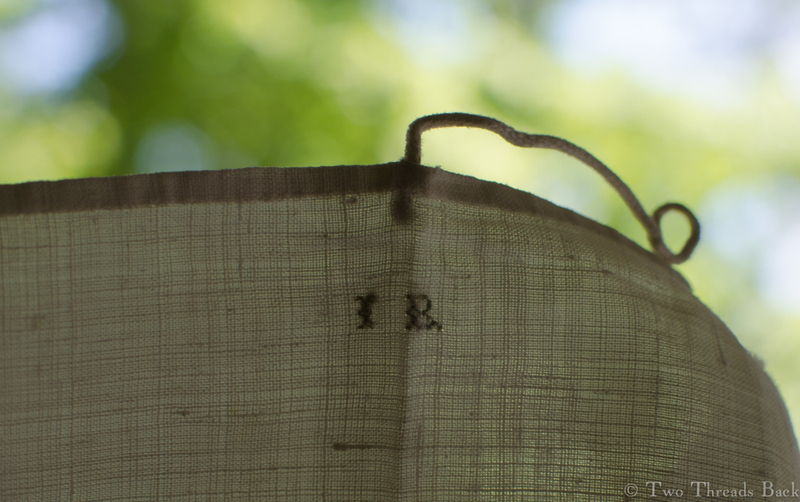 Blue cotton marking, “I R” – who was she? It’s easier to see when held against the light. I think my favorite bit of handwork here is the mending. 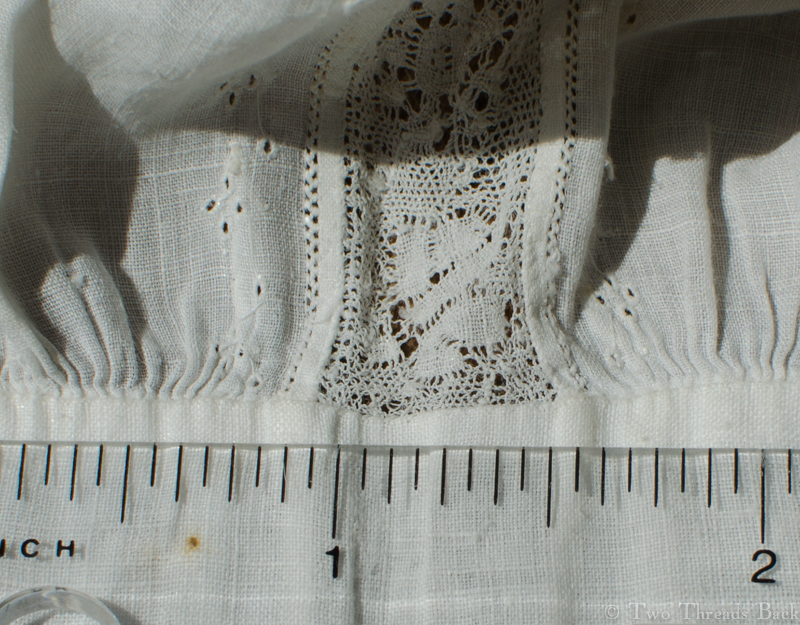 These sleeves were worn enough to fade the marking, but I don’t know if the repair is due to a worn spot or a tear. Either way, the fix is a work of art. The mend from the inside. The mend from the outside. 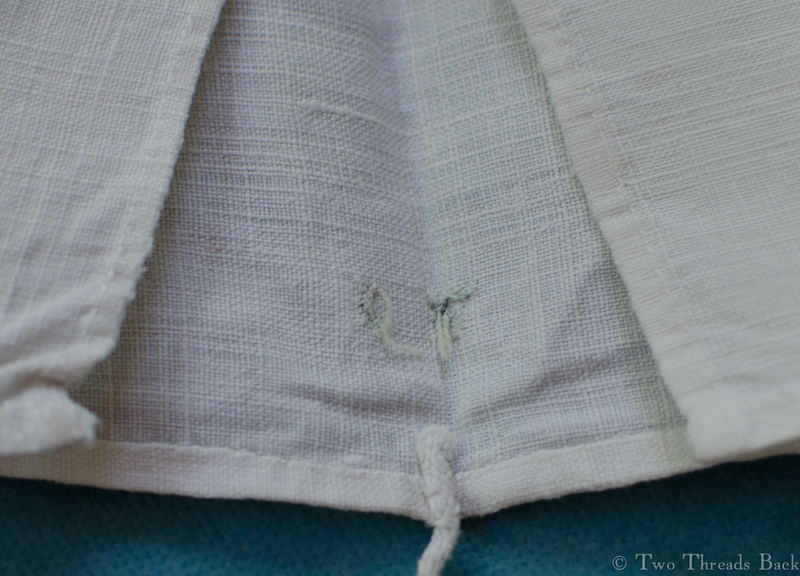 Just above the marking is a fine cotton cord, obviously meant to attach the sleeve to another garment. Both are still in place and appear original. Well, so much for my observations and (right or wrong) interpretation. On to my questions. Why are the sleeves so big? 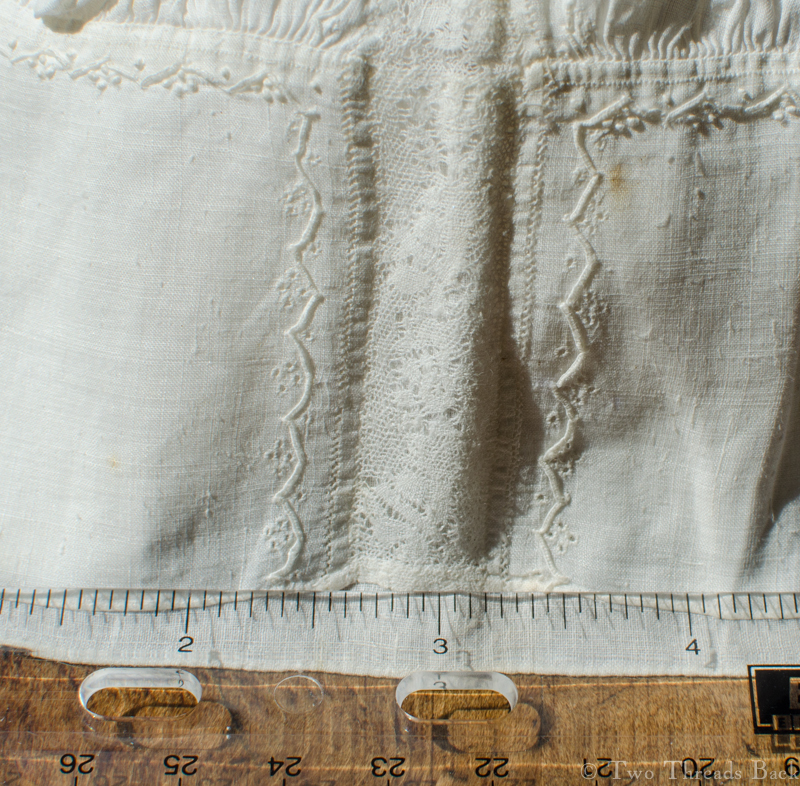 The circumference of the linen end is about ten inches, the muslin cording about nine inches. My scrawny wrists are less than five and a half, and so the sleeves look absurdly baggy when I slip them on. And even men’s shirts of the era don’t usually have cuffs that big, so it can’t be just me! What were they worn with? The total length is about seven inches, so they’re really too long to fit the end of a long sleeve anyway, without some peculiar looking bunching up. Were they not intended for ladies’ apparel? Were they worn with some special type of clothing, religious or a costume? Open slit in the upper band. 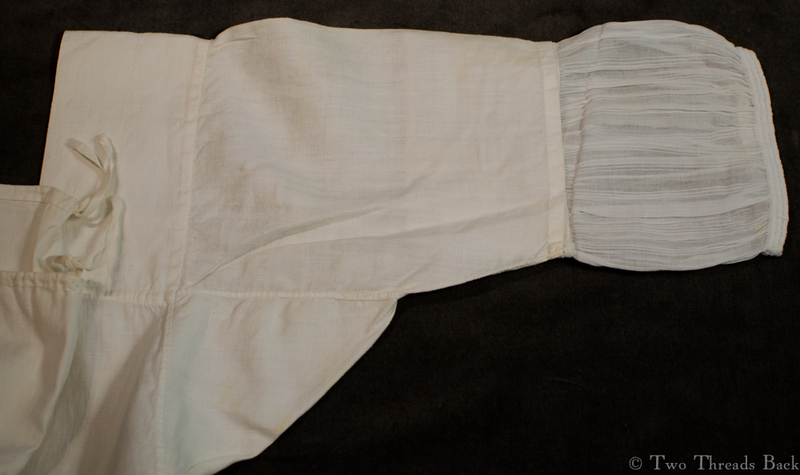 Why is there a slit in the linen band? It’s configured so that the hems are not meant to be turned back. Why is there no way to adjust the corded gathered end? They are a fixed size. Hmm. As I was trying them over my hand and onto my wrist, I tried slipping them up my (correspondingly scrawny) arm, past the elbow. Aha! A perfect fit! 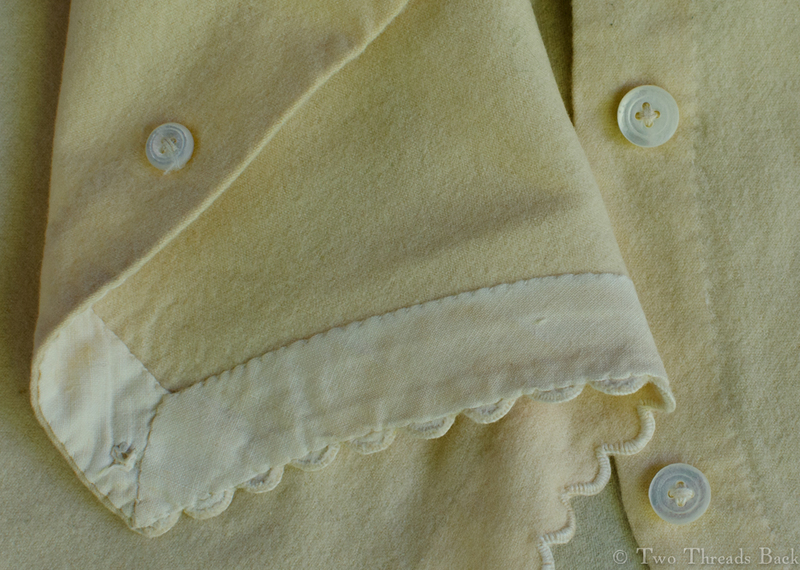 And the opening in the linen allows for movement or shifting around a bit on my arm. So is that the answer? I’m so accustomed to seeing the underleeves that were worn in the mid-nineteenth century, or the cuffs that have been worn for centuries, that I wasn’t expecting something different like short sleeves. 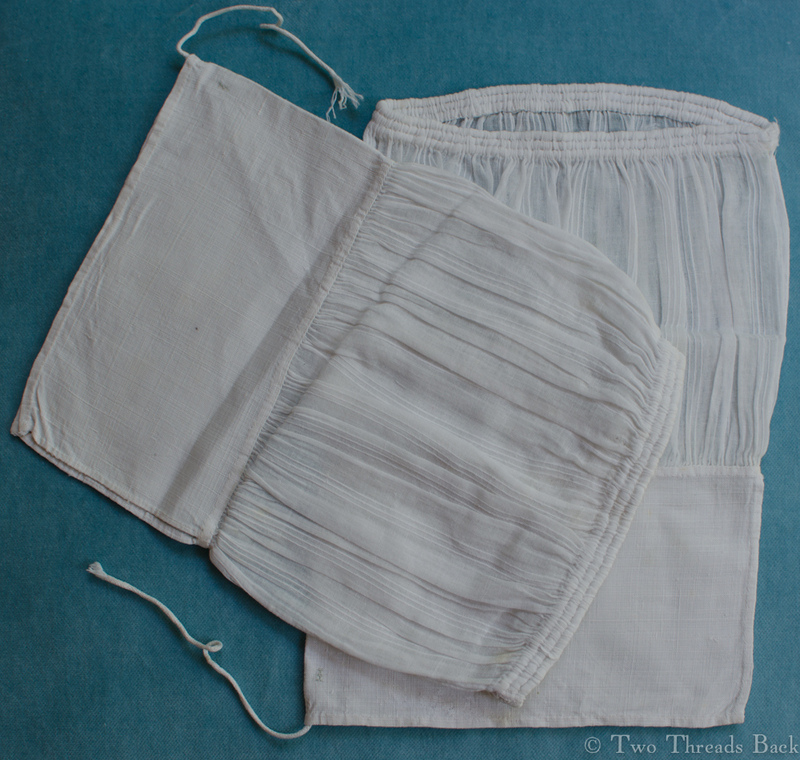 Were these intended for wear with the short sleeved gowns of the Regency era? I don’t know. I’m not (always) shy about sharing my costume and sewing blunders and misunderstandings. So if you have the answer up your sleeve, please – do tell! 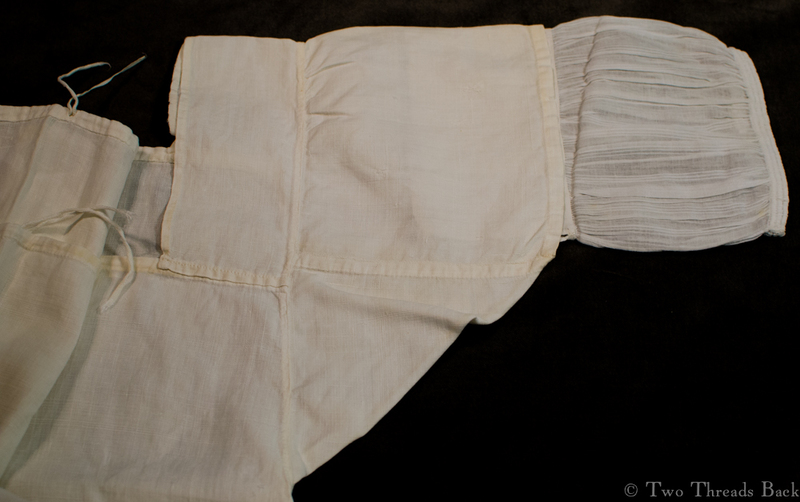 Diaper cover, late 19th century. Plain sewing in flannel! 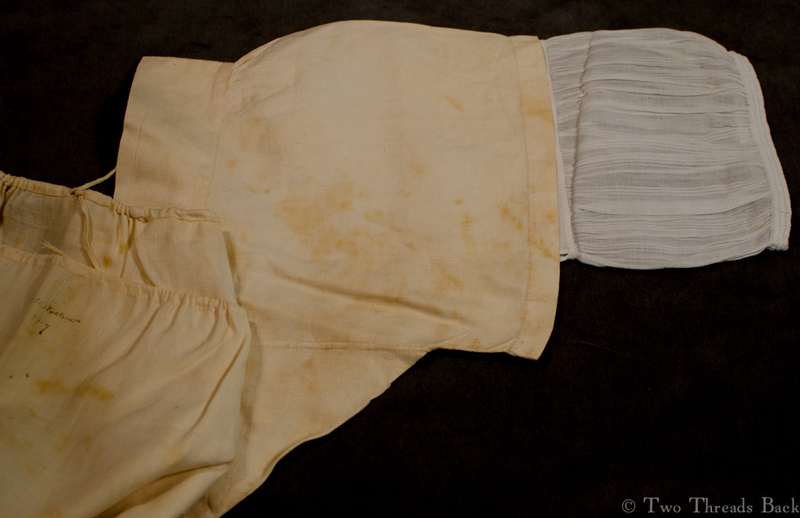 Could those red cotton stitches be laundry marks? 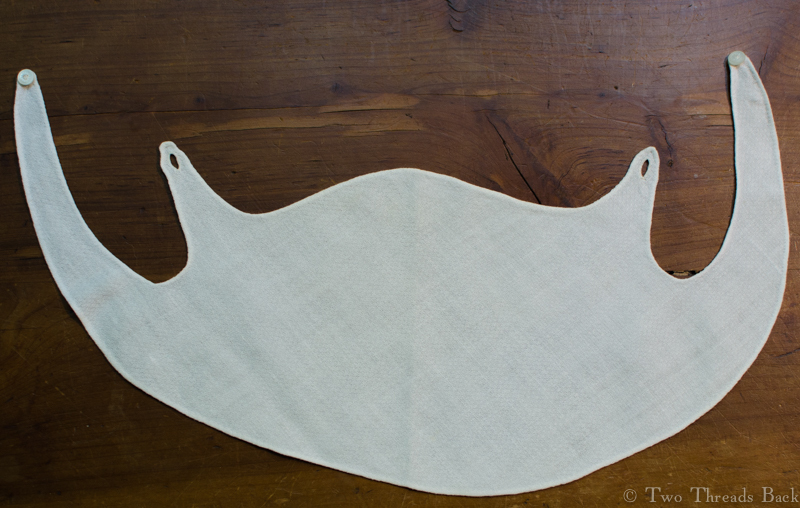 Plain sewing examples are usually cotton or linen, but here’s one of wool flannel: a baby’s diaper (or napkin) cover. 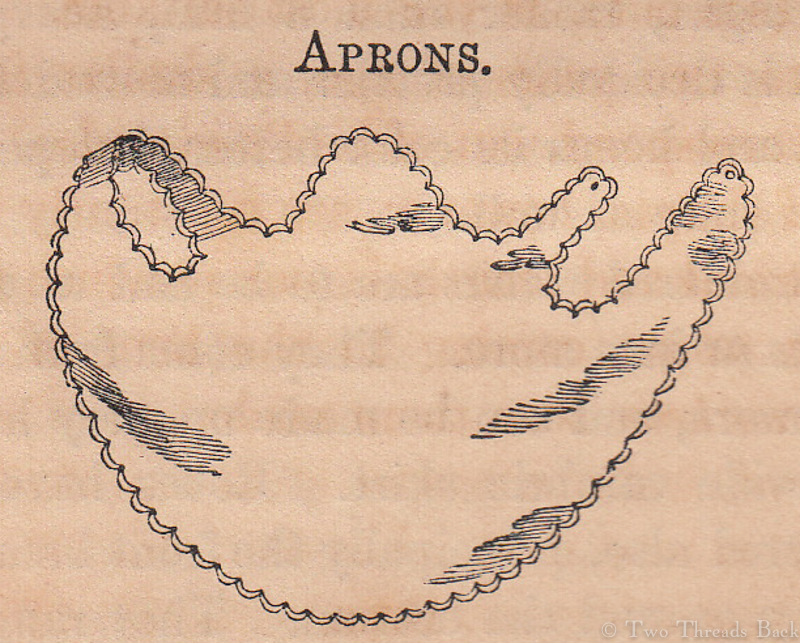 Maybe this one is similar to what Mrs. Bakewell meant in her 1836 Mother’s Practical Guide. 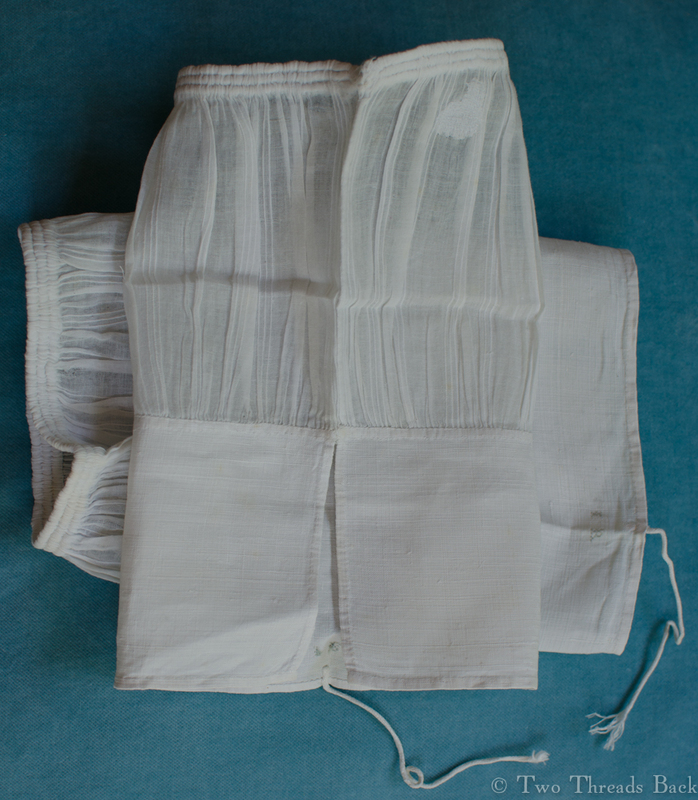 “I cannot too strongly recommend the use of a flannel napkin over the diaper for the very young babes, when they are carried out. The chest, too, should be guarded with flannel, especially if there be any constitutional or hereditary predisposition to inflammation.” Wool, the cure for what ails you! 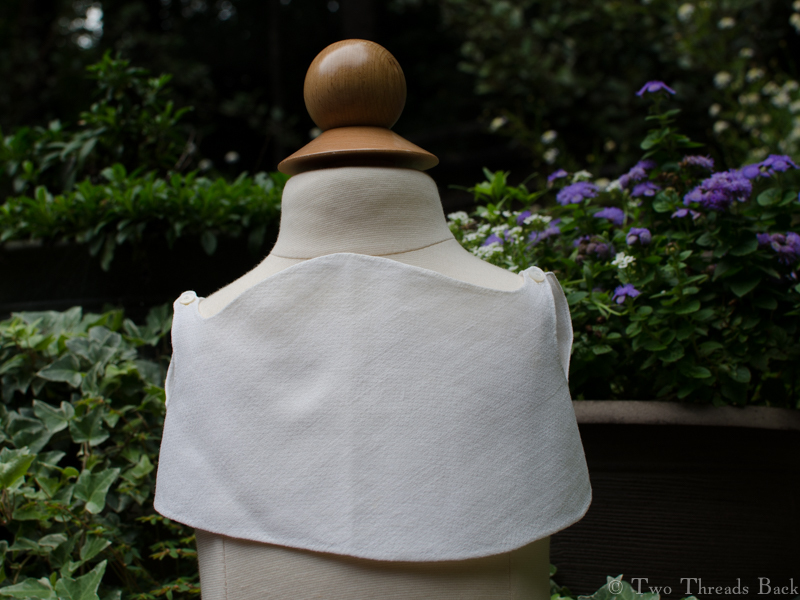 Instead of the herringbone stitch, this has been bound with a cotton facing and trimmed with a blanket stitch in neat scallops. 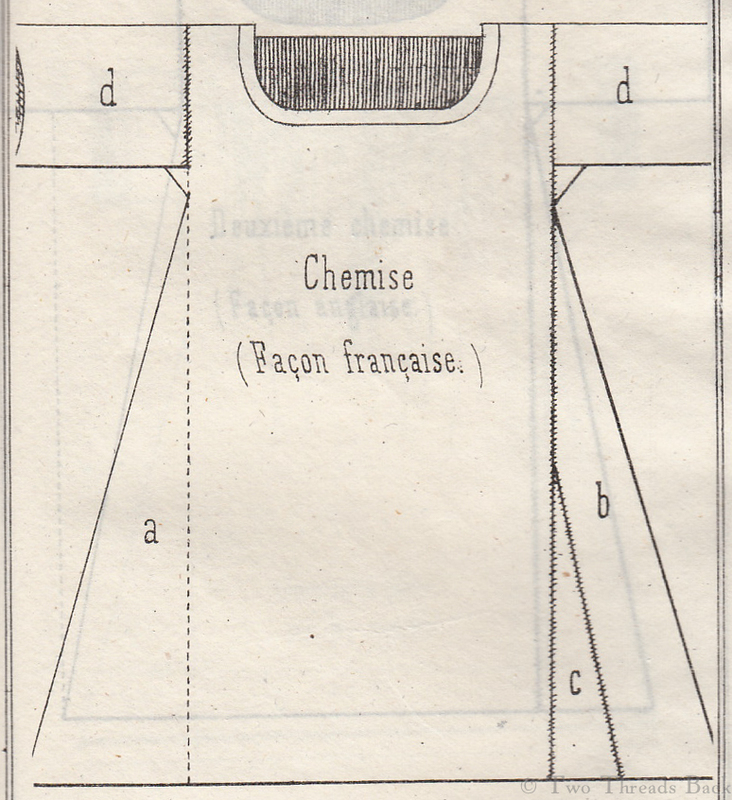 Herringboning, the stitch recommended in period manuals for anchoring seams on heavy material, wouldn’t have been sufficient to secure the edges, considering the laundering required. 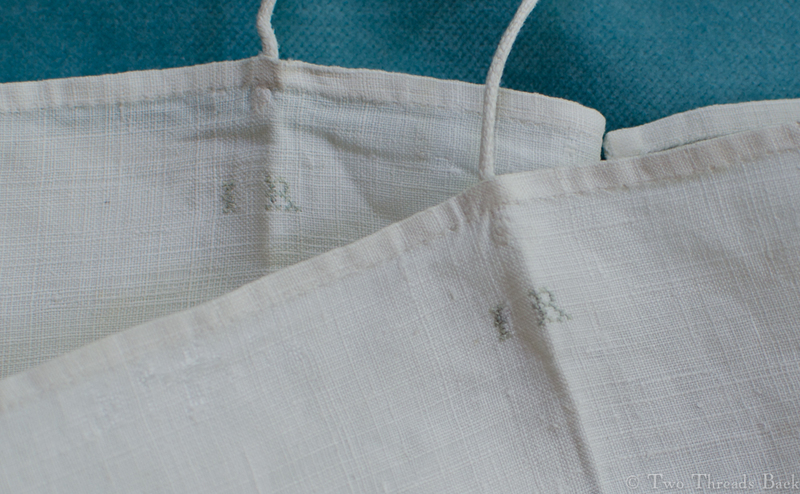 Cotton facings, hemmed with tiny stitches. It would be safer to fix on the clothes of an infant with strings than pins, as these often gall and irritate their tender skins, and occasion convulsions. Instances have been known, where pins were found sticking above half an inch into the body of a child after it had died of convulsion-fits, which, in all probability proceeded from that cause. 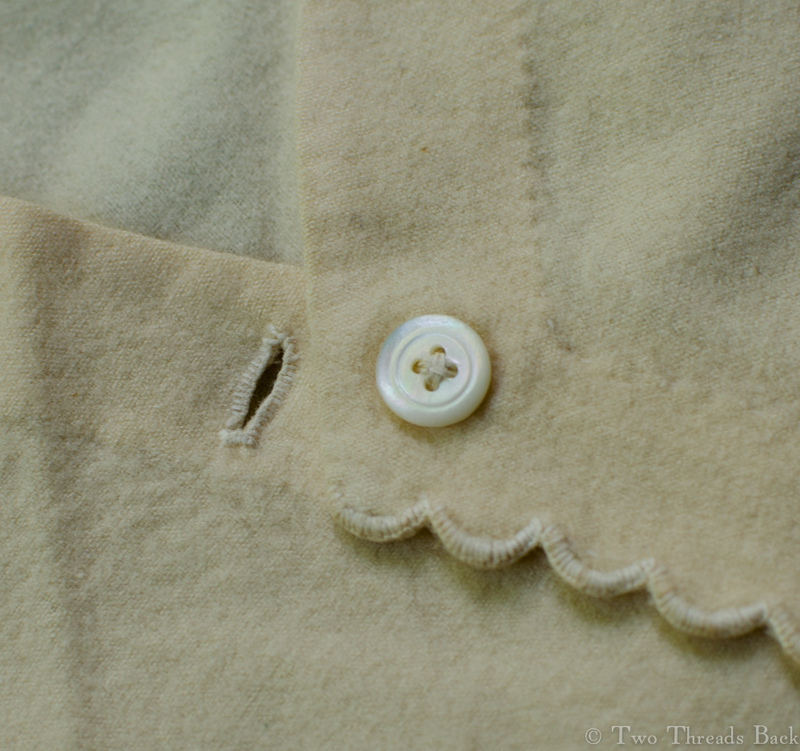 Closeup of the button and scalloped trim. Better than straight pins, any day! Unless the fits resulted from trying to scratch the wooly itches! 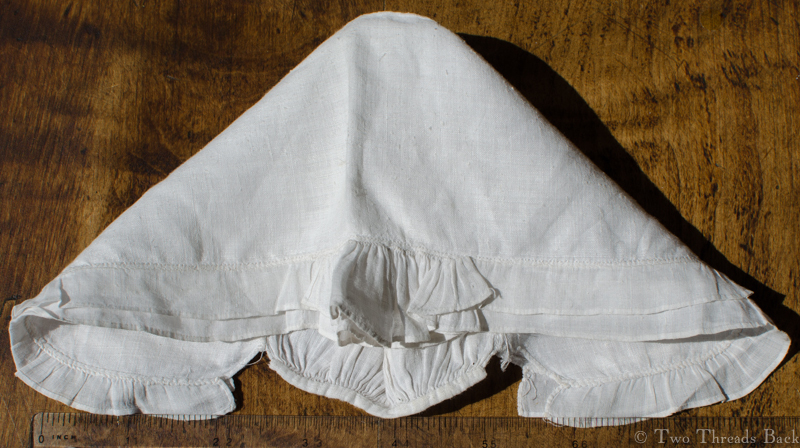 Another 18th century baby’s cap – with frills. This little cap is a favorite. 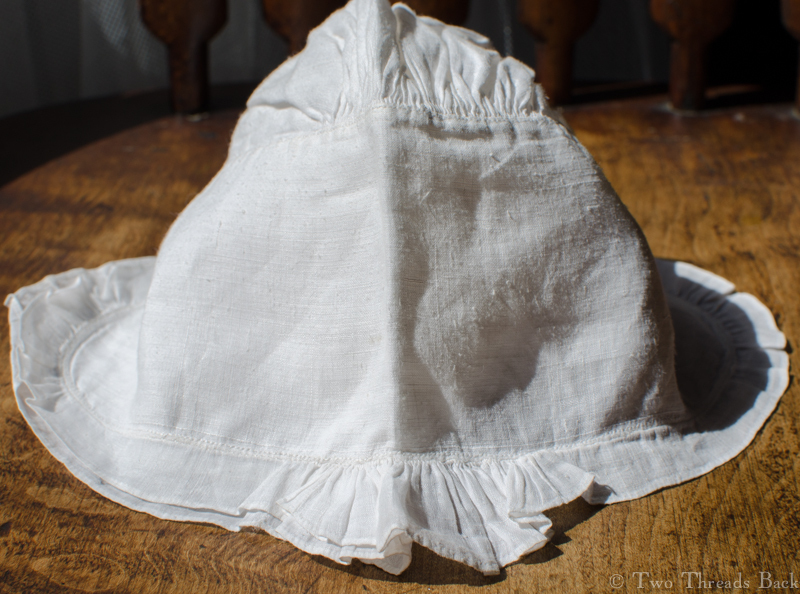 Yes, the linen is coarser than the lovely smooth cambric in most of the other really old baby things I’ve found. The slubs are noticeable, and they show even more due to washing and wearing. But there’s just something about that little ruffle around the brim. And the extra gathers right in the center – can’t you just see them sticking up, stiff with starch? Rather like a little plume or crest! A perfect frame for a baby’s face. 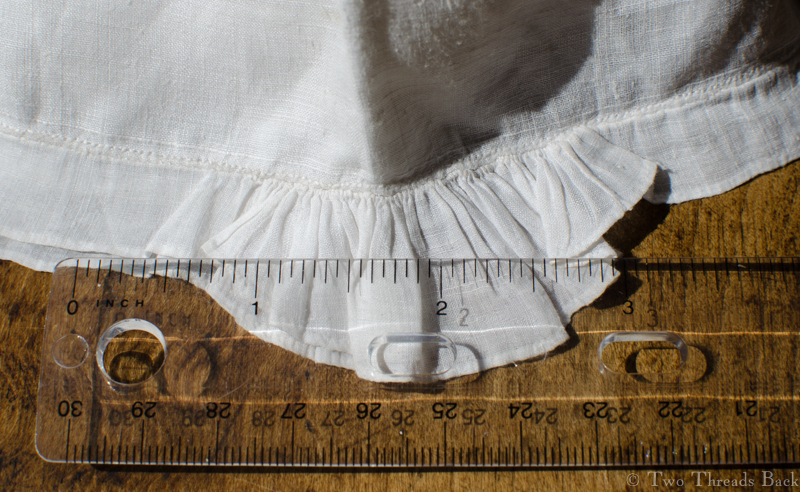 The measurement around the brim, including the ruffle, is about 12 inches; the center front to the back is about 9 inches. 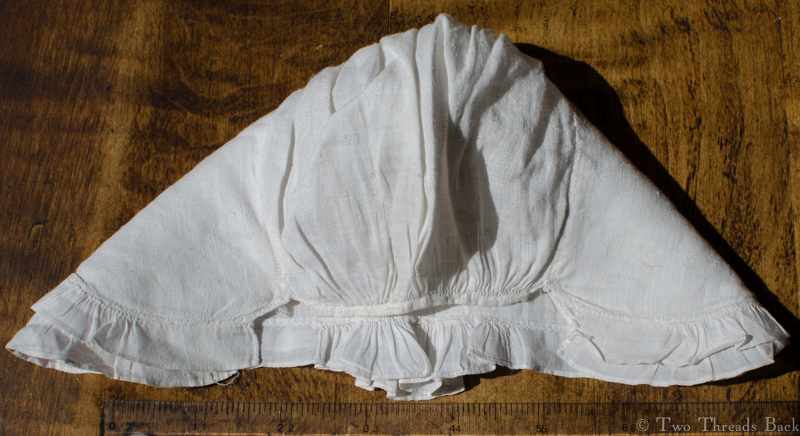 Baby’s cap with the two-part brim folded open. It seems like every time I examine a garment to write about it or list it for sale, I find something I’d overlooked before. And sometimes it’s unusual, a feature I haven’t seen before. That happened here, too. 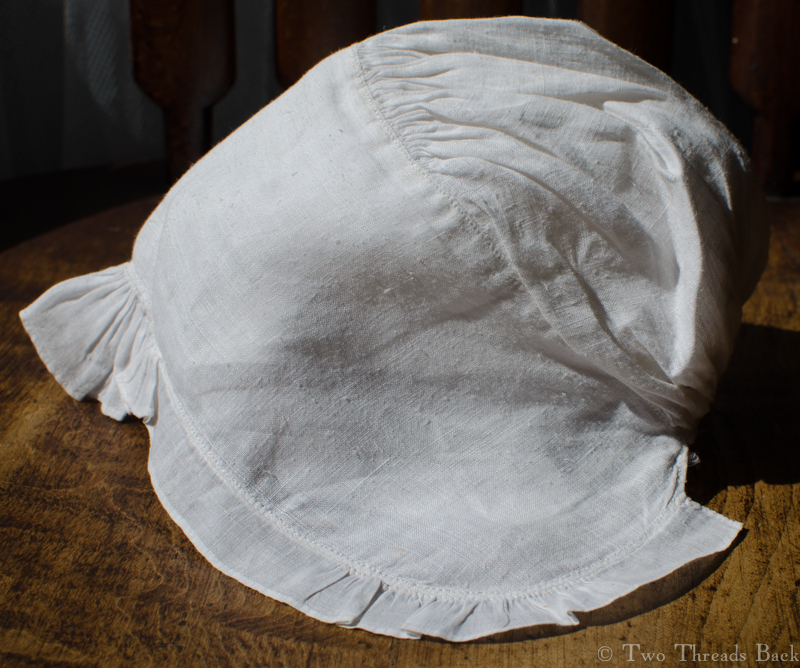 The little crown was stroked and gathered and attached to the upper brim with backstitches, the same way cuffs or collars were attached to shirts. 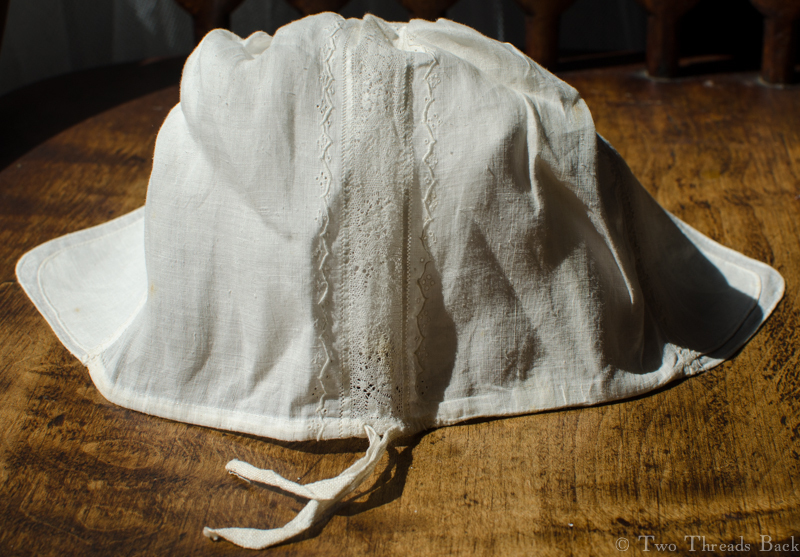 Then the under-layer-brim was hemmed to the crown from beneath. That does make the technique look like “setting in,” a construction process taught from (at least) the 18th to the early 20th centuries – if you’re one of the rare people who’ve seen my book Plain Needlework, you know what I’m talking about. The strangest thing though, is how the upper layer is hemmed. It’s backstitched! 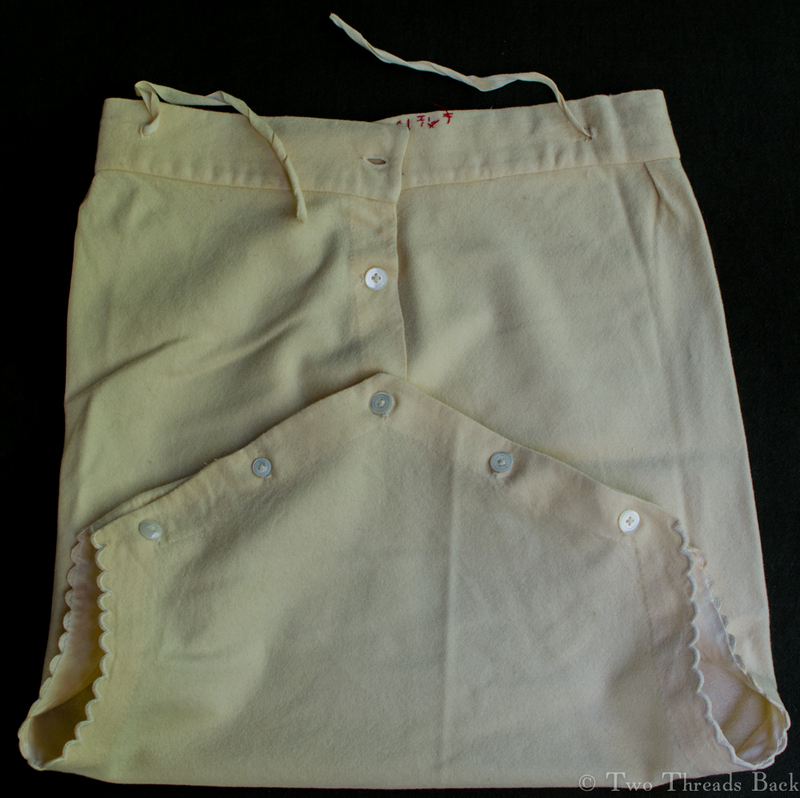 But not securely on the folded hem itself; instead the stitching rests along the very edge. In fact, I really don’t see how it holds. I’ve looked at it with magnification because it’s so different from what I’m used to seeing. But that’s right. The hem is barely caught with the backstitches. 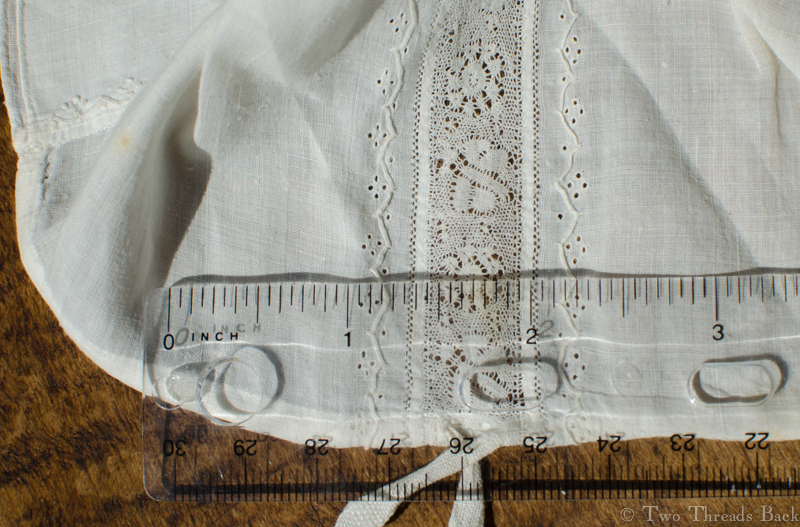 The under layer is normal – if you can call a 1/16 inch hem normal; it’s simply hemmed. Then the ruffle is whipped and gathered on both. 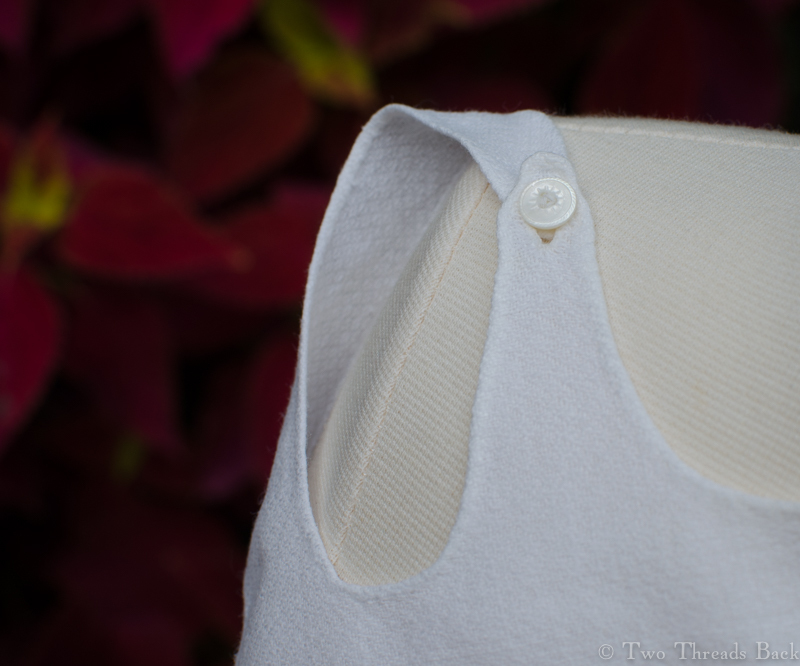 The back of the cap is gathered and set in a narrow band, also with backstitching. 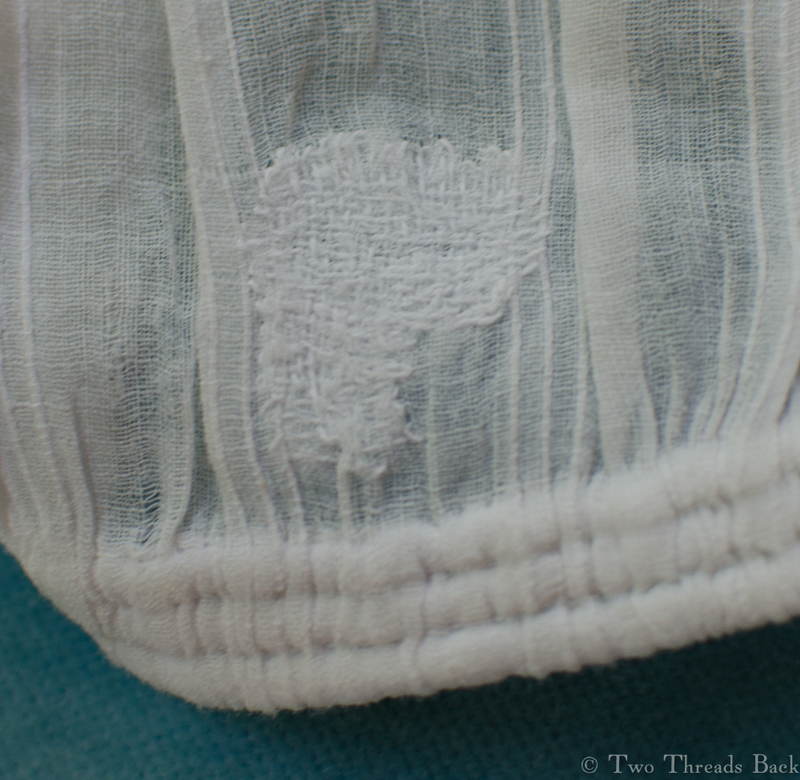 A closer view of the “plume” – and you can see the backstitched hem. 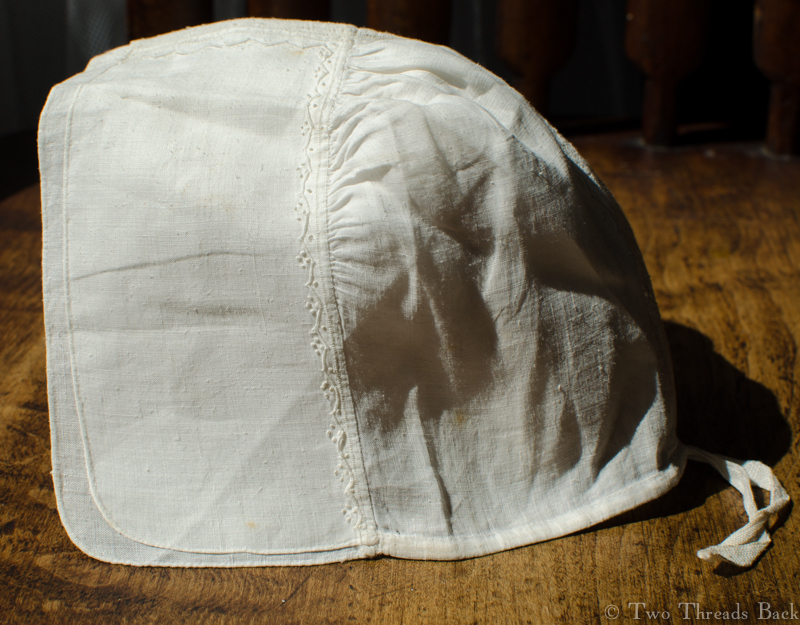 Like last cap I wrote about, this one is in remarkably fine condition and there are no vestiges of ties. 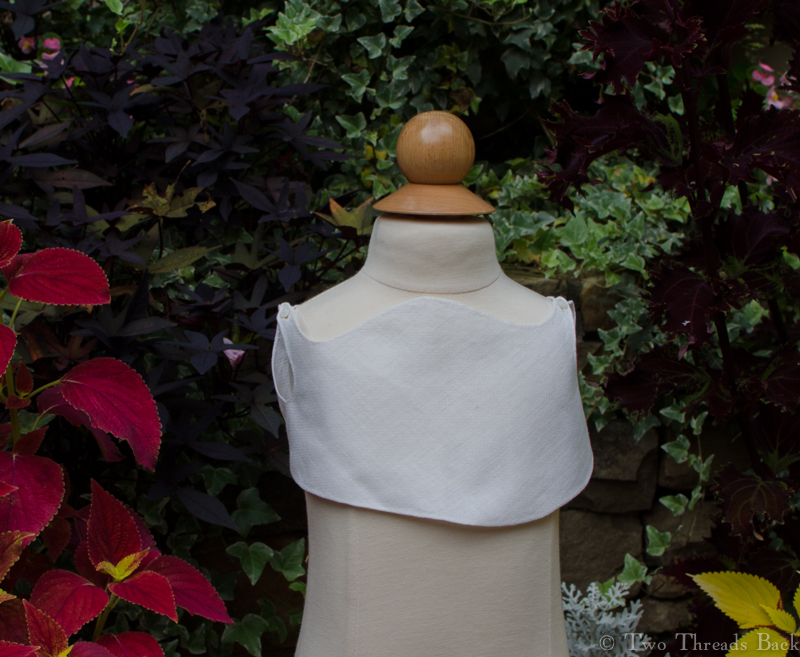 Unlike many other fine linen bits, it’s lost its starch. I think the wearer would have approved. Floppy ruffles are more comfortable. A back view of the cap.